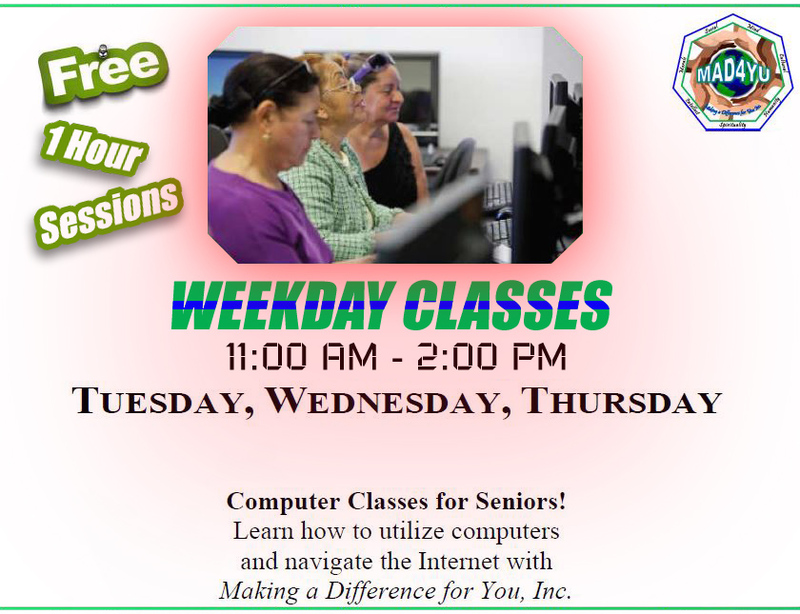 Adult Computer Tutoring Sessions – Making A Difference For You, Inc. Learn Windows & Microsoft OfficeGain valuable knowledge and add skills to your resume. Not too long ago, business education teachers gave formal instruction in typewriting at the high school level. At that time, the skill of typing was a necessity for certain occupations. Today, efficient keyboard and computer operation is a necessary skill for the majority of occupations. To make an appointment, please call our offices during normal business hours. Tuesday-Thursday 11:00 am – 2:00 pm and Saturday – Sunday 4:30 pm – 6:30 pm, the sessions are 1 hour to 1-1/2 hour. Imagine the things you can do with increased computer knowledge: keeping in touch with your grandchildren, viewing pictures that are sent to you, even renewing prescriptions and send messages to your doctor! You have unlimited resources at your fingertips. We would love to spend some time teaching you how to use a computer. MAD4YU has tutoring services available especially for the senior population. Each senior will be individually tutored by our knowledgeable volunteers. No previous computer experience is required and you can continue to attend tutoring sessions for as long as you would like. You can even schedule up to three sessions a week. Call our offices and make an appointment during normal business hours. Tuesday-Thursday, 11:00 am – 2:00 pm and Saturday-Sunday 4:30- 6:30 pm.